Case 1: Female, age 57, right index fingertip bitten off (Figure 2.1.1a), in-patient treatment with MEBO wound ointment for 15 days at a clinic, followed by out-patient treatment using the ointment. Half a year later her injured finger was completely regenerated with restoration of sensory functions and shape and form (Figure 2.1.1b). 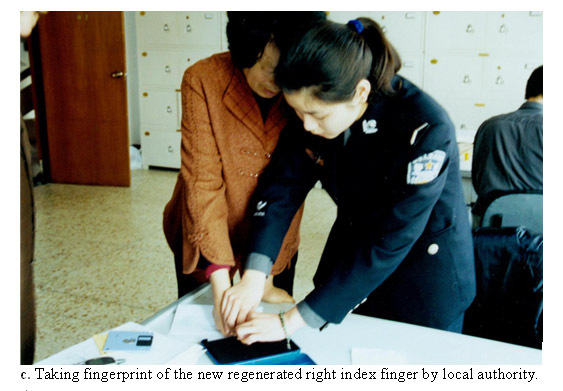 The fingerprint of the new finger tip was certified by the local authority (Figure 2.1.1c) as being identical to the finger print prior to the injury. Case 2: Female, age 35, thumb of right hand injured by machine. Case 3: Female, age 35, left middle fingertip cut off by machine. Case 1: Male, age 36, left middle and ring fingers crushed by concrete plane. Case 2: Female, age 42, right thumb lacerated by machine with bone exposed. Case 3: Female, 28, distal phalange of right thumb damaged by machine. Case 4: Male, 18, distal phalange of both thumbs entwisted by machine.